Sweet Corn and Palak Masala is a healthy and great combo with any Indian Bread like roti's, phulka's, chapati and so on. Its simple and tastes great. The dish looks super cute with the green and yellow combo. You don't need any extra effort to present it. 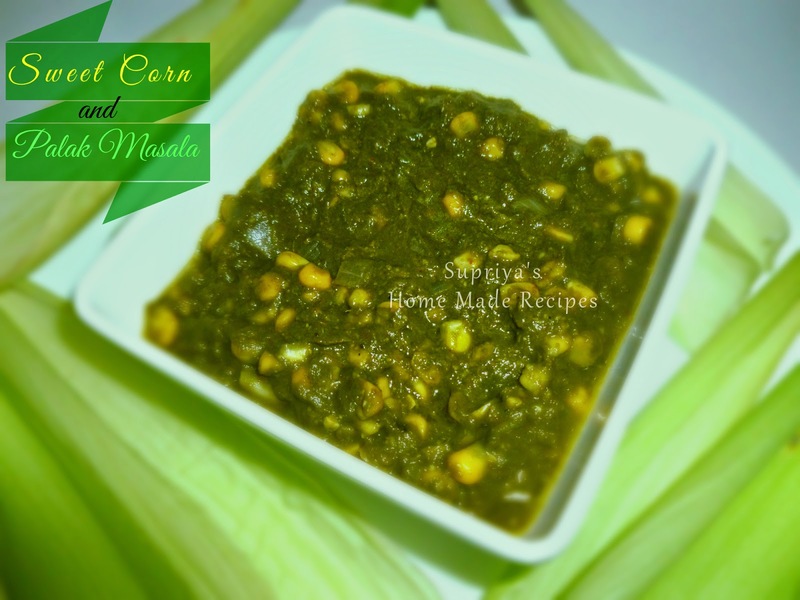 Here's a simple yet tasty healthy Sweet Corn and Palak Masala. 1. Clean and blanch the spinach leaves. Make a paste of Spinach, green chillies and tamarind paste. 2. Heat a wok with 2 tsp of oil. Add chopped Onions and fry till they turn slightly golden in color. 3. Add ginger - garlic paste and saute it for a minute. 4. Pour this prepared palak paste and also drop in the sweet corn. Add water according to your required consistency and cook for 5-6 mins. 5. Now add haldi, garam masala powder and salt. Mix it and cook for another 4-5 mins in a low- medium flame or until oil separates. Enjoy with roti's, chapati or phulka's. Yummy!I love palak with corn. My mum makes yummy palak and corn dish with plain paratha.